SiteGround has accumulated a lot of praises all over the world for being one of the best web hosting providers. They have been in this business for almost 14 years. With the passing of time, they are getting more recognition. They have some eye-catching hosting packages for every type of customers. Some of them are typical and some are very advanced. And, among them, the ‘Enterprise Hosting’ is one of the notable ones. Besides that, they have been famous for the quality and stability of their service. So, if you are trying to find the best and robust hosting solution for your website/s, then you should take a look at the ins and outs of SiteGround enterprise hosting service. And, to make this process easier, we have compiled this post for you with some of the most crucial information about SiteGround. So that you can be out of the dark while choosing the enterprise hosting service from SiteGround. First of all, let’s know about Enterprise Hosting. Lately, ‘Enterprise Hosting’ has been introduced in the world of web hosting. If you don’t know what it is or how it works, let’s get to know at first. Enterprise hosting is totally different from any other hosting packages. Normally, when you go to a website of any web hosting provider, you will see some pre-made packages for their customers. In that case, you are not in control of the features of those packages. Although they have a lot of different web hosting packages, sometimes it is possible that you won’t find the best match for your needs. For that type of situation, the ‘Enterprise Hosting’ package is there. Using these package, you can order your web hosting package from the hosting companies the way you want. In a few words, it will be a custom-made web hosting package for you. You will tell your web hosting provider about your needs first. Then they will let you know what they have for you. After that, both of you will come to a decision about the whole thing. And, lastly, you will get a custom-made web hosting package which will be the perfect fit for your website’s need. The good thing is that you don’t have to go through all of the technical things. Instead, your web hosting provider will take care of those, you just need to tell them about your requirements. Also, you don’t have to manage the servers even after getting the package. They will do it on behalf of you. And, you can order any type of web hosting whether it is a dedicated, cloud, VPS or any type of other advanced ones. It doesn’t matter. You can get what you want when you are using ‘Enterprise Hosting’. As you already know that, enterprise hosting is not ready-made, you need to choose your plans yourself. However, to make the process simple, SiteGround has come up with a great idea. If you want to get an enterprise hosting account, you can choose a monthly budget instead of the plans directly. So, depending on your budget they will be able to help you to offer the best plan for you. Now, they have 4 categories of the monthly budget. They are 2000$ – 3000$, 3000$ – 5000$, 5000$ – 10,000$ and 10,000$+ respectively. You can choose the amount of your budget while contacting them. And, the rest will be taken care of by them. You don’t even need to think about setting up your servers. Everything will be done by the SiteGround team for free of cost. And even the maintenances of the whole system will be performed by them at no extra cost. Who should choose the SiteGround Enterprise Hosting Plan? Simply put, enterprise hosting is not for everyone. And, also, anyone can use it if they want to. So, do you need to get an enterprise hosting account? You will find the answer below. There comes a time when you need a website hosting package custom-made for you. Let’s say, you have a website which receives millions of visitors in a month. In that case, there is not enough number of hosting packages for you to choose from. In order to achieve the best performance on your website, you should contact directly with SiteGround and create one of a kind hosting server for yourself. Again, if you are so busy handling your own business that you don’t have the spare time to deal with all the technical things of a hosting service. Then enterprise hosting could be a good choice. Because SiteGround will take all of the responsibility of your website/s and the entire system on their hands. So, you won’t have to worry about it anymore. If you are not a techy person, then the same goes for you too. There’s no limit on the possibility. So, you can ask for a public or private cloud configuration, or just a single server, or even a geographically distributed cluster architecture to SiteGround. And, they will build the system for you. 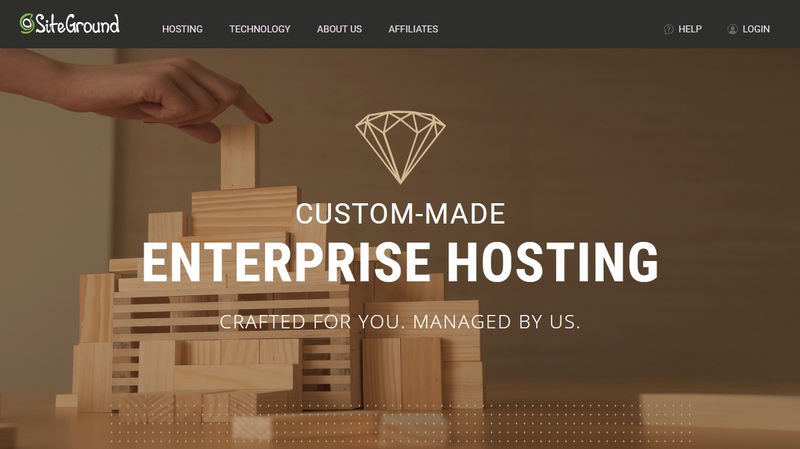 So, if you are not satisfied with all the available pre-made hosting packages, then your best bet would be to choose the ‘Enterprise Hosting’ package of SiteGround. Although you need to know that this hosting package is costly and the price varies depending on your requirements. Great for hosting what applications? Siteground has support for all of the major web applications. You can use any one of the CMS (Content Management System) on your website with enterprise hosting. But, they have special software, plugins, and optimization for CMSes like WordPress, Drupal, Joomla, and Magento. You will get the famous ‘SuperCacher’ plugin with all of these applications. The ‘1-click install’ feature is also available to simplify installing any CMS for you. Other than that, features like Git integration, staging and SSH are all available too. So, you can use your favorite CMS without any limitations. With the Enterprise hosting plan, you will get some enterprise-class services too. We will speak about some of them below. Whatever you order from SiteGround, they will use the best and highest quality architecture to provide you with the best experience. Siteground uses ‘Linux Containers’ which are very lightweight and enhances your website’s performance by many times. After getting an enterprise hosting account with SiteGround, your goal would be to improve your website/business. You don’t have to think about managing the servers or the system. Siteground has multiple dedicated teams for their enterprise hosting users. Everything from start to finish will be monitored by the teams. Even, they have some useful and advanced software to look after your site and servers 24/7 without any interruption. So, if any issues arise, they can solve that instantly. Do you want to use a new custom development workflow with this package? You can do that. Even you can use any of your old development workflows. Siteground team will help you to integrate that seamlessly. If you have a website which is very popular, it is normal that you will get spikes in traffic from time to time. Now, in that case generally, your website would crash if you receive visitors more than your host is capable of. But, when you use the enterprise hosting, you can tell about that issue to SiteGround and they will handle that situation with ease. You will be able to use additional resources on your servers on the go. The server where your website is hosted won’t even have to reboot. So that your website won’t go down in the meantime. The package will come with high-redundancy. As a result of that, your website won’t go down from time to time. However, it depends on your plan and your requirements. You would be glad to know that SiteGround has 4 different servers in 3 continents. And, you know it is better to host your site closer to most of your site’s visitors. That way, your website will perform faster and better to the majority of your site visitors. Now, as SiteGround has 4 data centers, you can order your site to be stored on 4 of those data centers simultaneously or selectively too. They can do that without any problem. So, you can help all of your readers from every corner of the world equally. That is one of the best solutions for a website which receives visitors from multiple major locations of the world. 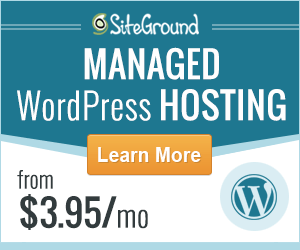 By getting the enterprise hosting solution from SiteGround, you will be one of their VIP customers. So, you will be getting the best of the best service from them. Your services will include all the regular services like the 24/7 helpdesk priority support. You can, of course, contact them anytime using the normal methods i.e. Live Chat, Instant call, and Tickets. But, you will be given so much more. First off, you will be able to talk with them about your requirements as long as needed. Then they will do whatever they need to do according to your instruction. But that’s just the start. We will talk more about this below. 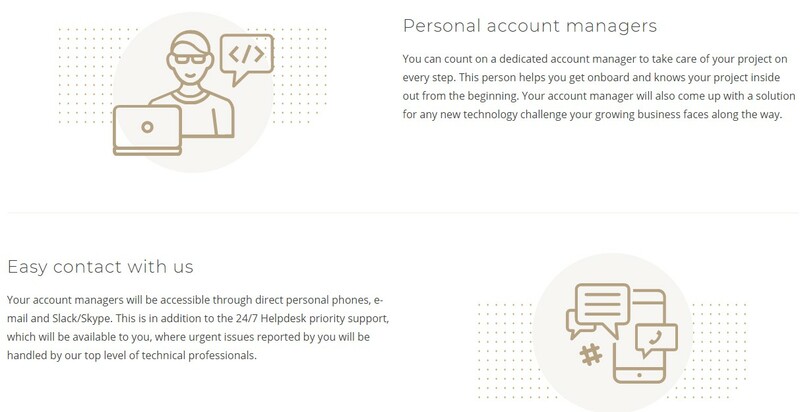 You will have a personal account manager when you get an enterprise hosting account with SiteGround. The account manager will help you from the beginning to the end. S/He will know everything about your hosting package. S/He will come to help you when you need them. You can get in touch with your account manager using e-mail, slack, Skype and even direct phone calls. So, you won’t have to worry about anything at all. If anything bad happens, there will be support from SiteGround’s top-level technical professionals. They will handle the situation from there. Yet, you will have the master control over all of it. As you know you can choose all the necessary things while getting the account, you will have access to all the features available from SiteGround. You just have to let them know your preference. Usually, all the typical features like Free SSL, Backup, MySQL 5 & PostgreSQL, cPanel, AutoInstallers, different versions of PHP are there. Along with these, you will be able to get the advantage of the advanced features like Private DNS Server Setup, Advanced Mail Server, Free dedicated IP, and Master Control etc. will be also available. In short, you will have every basic to advanced features for choosing. Just, tell them your desired features they will add that. There’s more. If you want to customize your package further, you can use additional enterprise programs based on your needs. They have special support for programs like MongoDB, ElasticSearch, Redis, Solr, and Memcached etc. Plus, all of the necessary OS, security software will be also installed with the package. You will just need to launch. Depending on your situation, you will be able to customize your package even when your package is already active. You don’t need to get a new one instead. By using enterprise hosting, you are getting all the freedom and flexibility you need. Now, we will be conducting some tests on SiteGround. By the time we are done, we will get to know the load speed of SiteGround’s server. To perform the tests, we will use a website which is hosted on SiteGround. That way, we will be able to assess the accurate performance of SiteGround. For that reason, we will be using this website i.e. ReviewPlan.com. Because we have been using SiteGround to host our site for a long time. The test will be using the popular Pingdom website. We will be utilizing the two test servers (the USA and Europe) of Pingdom to run the test. The result indicates that our website took only 829 ms of time to load fully. This is an awesome performance. Normally, if the load time of a website is around 2 seconds you should be content. As it is the standard load time. Here, our website load time is way less than that. We are happy with that. This time, our website loaded within a split second. The load time is just 685 ms. This is even better than the last time. Our website has done better than 94% of websites tested on Pingdom. So, this is a clear indication of the performance and quality of SiteGround. After conducting the tests on 2 test servers, we can see that our website did excellently. Now, this was only possible because of the quality service from SiteGround. Unless we won’t be able to accomplish that. It is normal that whenever you’re going to choose a website hosting provider, you need to check out their uptime record of them in the first place. But, some of us skip this important step without even noticing it. But, after using for some days, when you find out that your website goes down from time to time, then you start to notice it. So, before you choose any web hosting provider, you should always inspect about the uptime record of that hosting provider. Now, this is also not an easy task to do. First, all of the website hosting companies are the same. Maximum times, you will see that they are mentioning (on their website) that they are maintaining 99%+ uptime record. In reality, it is the exact opposite. They try to fool you because the industry-standard uptime record should be above 99%. So, they lie about it. However, as it is difficult to know which is true or which is false, you need to go deep. You can know the authentic uptime record of a website hosting company from their real users. To tackle this problem, we are here for you. As you already know that we use SiteGround, we have been keeping a log of the uptime record of our website hosted on SiteGround for a long time. We will share this secret information with you so that you can be sure about SiteGround before you commit to them. Here is the uptime stat of our website (ReviewPlan.com) for you. Remember, we always try to update it. So, if you want to get the latest update, just come back here anytime. Now, on the image above, you can see the uptime stats of our website for the last 10 months. 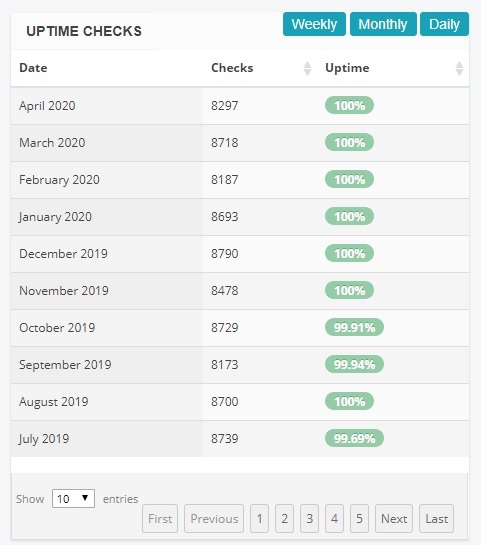 It is clear as daylight that SiteGround has incredibly kept the uptime record of our website to full 100% for most of the months. And, in some of the other months, they have slipped from the 100% mark. However, it was never below 99%. So, we can say that SiteGround is definitely among the top uptime record holder web hosting providers. To keep the uptime record perfect, they have taken a number of advanced steps like the pro-active monitoring system. With this innovative technology, they are able to monitor their servers every 0.5 seconds. So, if anything goes wrong even in a split second. They know it promptly and can solve that quickly. But, the best feature of the pro-active monitoring system is not that. Rather, it is one of a kind advanced features. Let me elaborate. This advanced technology is able to predict some critical issues before even happening. So, the team can take care of the situation in advance. They have some other special tools to keep their servers stable. Overall, they have been serving us the best and we are very satisfied with the uptime record of our website. Customer support from your hosting provider is important. But, when you are using their enterprise hosting package, then it’s more significant. So, you need to check on them before you finalize the deal. As a result, you should know about the quality of SiteGround’s customer support. Luckily enough, we are already a SiteGround customer. So, we have our own experience with their support team. For you, we will share our thoughts about them. So that you can be certain. Now frankly, SiteGround has one of the most professional and helpful customer support teams in the world of web hosting. As we sometimes need their assistance in various cases. They always do their level best. They are responsible and very fast in their replies. You don’t have to wait in a queue at all. As they have 3 methods to get in touch with them. So, if you are in a hurry, you have the ‘Live Chat’ and ‘Direct Call’ option. Using those options, you are guaranteed to get the first response from them in less than 30 seconds. Or else, you can use the ‘Ticket’ system. This is also good. Last but not the least, you need to consider that SiteGround offers some other special ways to communicate with them if you are one of their Enterprise hosting user. In that case, you’re a VIP customer of them. You will always get the highest priority among other users. We have already talked about this earlier, so we will skip this time. There’s also another way to communicate with them. You can go to their offices directly. They have 4 offices in Sofia, London, Alexandria, and Madrid. So, if you are from any of these locations, you have the option to directly visit them too. SiteGround keeps a record of the experience of their customers who have contacted them for the time being. From that research, it is seen that about 99.7% of customers were satisfied with their customer service. They all have left a 5-star review about them. And, we are also one of their pleased customers. The Final Verdict: should you use SiteGround Enterprise Hosting? Web hosting world is highly competitive. So, the providers do their best to get the best of you. In doing so, sometimes they use shady tactics like bogus advertising. So, you have to be so careful while choosing a web hosting provider for you or your business. The best way to do that is to look at some of the most important factors about them first hand. To save you from that hassle, we have gathered and shared all the significant and insider data of SiteGround. So, you can decide for yourself. However, the best thing about SiteGround Enterprise Hosting is that you don’t have to do anything except for letting them know your specific requirements. They will provide the solution and create the perfect package and system for you. You will have the flexibility, performance, and support on an enterprise level. That’s why SiteGround Enterprise Hosting is so popular among many website owners. But, if you want to ask us for our opinion. Then, from our personal experience, we highly recommend SiteGround enterprise hosting for our readers. Choose SiteGround and believe me, you will be glad that you did. The best thing about SiteGround Enterprise Hosting is that you don’t have to do anything except for letting them know your specific requirements. They will provide the solution and create the perfect package and system for you. You will have the flexibility, performance, and support on an enterprise level.